Location: Raleigh, In Raleigh at the North Carolina Museum of Art. This application focuses on the House Creek Greenway beginning at the Reedy Creek Pedestrian Bridge and continuing onto the North Carolina Museum of Art's recently established Museum Park. The House Creek Greenway is unique in its combination of urban greenway design, art in service projects, and a multiple-agency partnership for management. The greenway is a model of the diverse strengths of its partnership between the North Carolina Museum of Art, North Carolina University's College of Natural Resources, and the City of Raleigh. The new bicycle and pedestrian bridge serves as a tangible symbol of the Museum's bond to the community. The 660-foot pedestrian bridge, which spans 1-440, is the longest pedestrian bridge in North Carolina. The House Creek Greenway is a vital link in the greenway system, serving as a conduit for accessing Umstead State Park, the Capital Area Greenway system, and will be a link to the regional American Tobacco Trail. On April 16, 2005, the North Carolina Museum of Art celebrated the opening of the new Reedy Creek Pedestrian Bridge, which links the Museum Park to the Capital Area Greenway System. The new bicycle and pedestrian bridge serves as a tangible symbol of the Museum's bond to the community. The 660-foot pedestrian bridge, which spans 1-440, is the longest pedestrian bridge in North Carolina. Its design was inspired the Sydney Harbour Bridge in Sydney, Australia. The bridge features triple steel arches and will feature dramatic lighting in the near future. The bridge is 660 feet long and 55 feet high at its highest point. The Greenway required the kind of partnership that is typical of Park projects. Primary funding came from the Department of Transportation. The City of Raleigh adopted the trail as part of its outstanding system of greenways and provided matching funding for the pedestrian bridge, the longest in North Carolina. 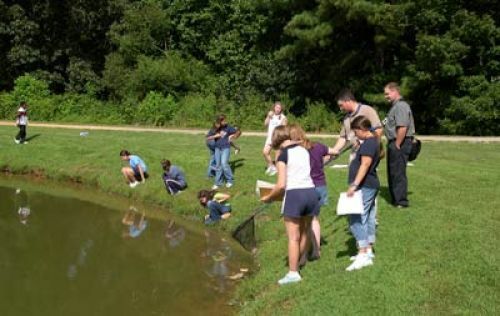 North Carolina State University's College of Natural Resources has partnered with the museum for assistance in long-term planning, development, and management of the Museum Park. The Museum gave the structure a more interesting design than it would have had as a strictly utilitarian project. An interest in visual design of useful objects led Gottlieb and curator Linda Dougherty to the concept of art in service, applied to the benches, sign frames, an bike racks along the Greenway by sculptor Al Prega. The artist welded them from iron bars recycled from the former prison. The Greenway crosses House Creek, a tributary of Crabtree Creek, via a wooden bridge at a location that provides easy access for the Museum Park Guides' "Water Quality/Quality of Life" school programs. Even this small urban stream contains crayfish, Black-winged Damselfly larvae, and other small creatures that indicate varying levels of water quality. The path enters an area of bottomland forest and then rises up a slope to drier, more open pinewoods dominated by Loblolly, Short-leaf, and Virginia Pines along with Blackjack Oaks. The eroded former agricultural land under them has regrown a savannah-like ecosystem with blueberries. Wild Quinine, Birdfoot Violets, and Pineywoods Goldenrod, a small species that blooms early in summer when other species are still developing buds. These are interspersed with a notable patch of Grass-leafed Liatris that blooms in autumn with other goldenrods. Before it reaches its highest elevation near the pedestrian bridge, the Greenway traverses a large grove of Flowering Dogwoods. This habitat is adjacent to two busy highways masked by forest buffers.